Here’s is a confession: I love Korean food and absolutely adore their kimchi too! I was first introduced to authentic Korean food when I lived in Singapore and have never forgotten how incredible everything tasted! And thus my love affair with Korean cuisine began! All thanks to a small family run Korean restaurant in Singapore called Dal-In Korean Restaurant. This is where I first tasted Korean food and fell in love with it. Since then I’ve tried many other restaurants in Singapore and they unfortunately have not matched up. It also helps that it’s always visited by local Koreans who live in Singapore… need I say more??! handful of Gochugaru (Korean red pepper flakes) – no substitute for this!! Chop cabbage into half and then further into quarters as shown in the pictures. Then into Muk pieces (bite sized pieces). Once done place them in a large bowl and wash them really well. approx. 2 or 3 times and drain well. Now in the large mixing bowl, place a small layer of cabbage and sprinkle some salt and then place the next layer and sprinkle another layer of salt and continue this process until there is no more cabbage left. Once the 2 hours of brining is complete the cabbage would have shrunk to half its original size and looking slightly limp then its time to rinse out the salt. Using the colander to rinse it 3 times. Remember you don’t have to rinse out all the salt, as some remaining salt will help the fermentation process. Once washed drain well. Squeeze all the water out of the cabbage and ensure that there is no more water left at the bottom of the bowl. For most people that think kimchi is high on salt – guess what?! its not! as you rinse & drain most of it away! Now into a mixing bowl add the well-drained cabbage, put your gloves back on and add a handful of Gochugaru (Korean red pepper flakes) and massage well into the cabbage. Next add the spice paste from the blender/ food processor and rub into the cabbage. spend 30 seconds massaging the cabbage, this will help the fermentation process. Leave to ferment in a dark, warm place either on the kitchen counter or elsewhere for 48 hours or 36. 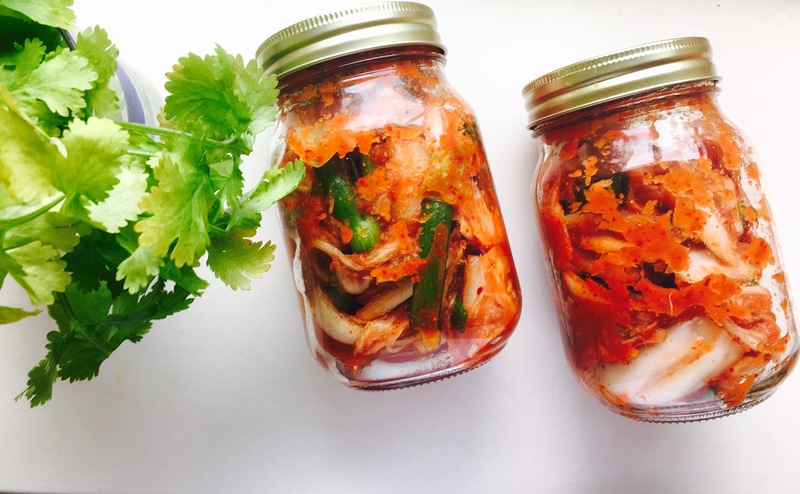 Once you see bubbles appear on top of the kimchi – its ready! Finally remember to unscrew lid every 24 hours to relieve pressure/gasses. :) Once fermented store in the fridge to stop or slow the fermenting process. Its best served cold as a side, condiment or just on its own.